To enhance audio quality, you can use Cyanogen AudioFX APK 2.1.0. Generally, audio on smartphone comes from two parts. They are hardwares as internal speaker and earphone. Listening music through premium headphone is very different form low-level one. Unfortunately, good hardware does not impact music player and file quality. Cyanogen audioFX delivers what everyone wants when listening music at smartphone. This app can be integrated with streaming service and manage audio level on screen. Android users might find many applications with similar functions. However, this app is downloaded with many users, which proved to be excellent. This app reduces complexity of audio enhancement on player. As you know, music app has specific feature to control sound output. However, many users find this feature too complicated because it is not familiar with some words. Audiofx consists of three controls. There are flat, jazz, and folk. 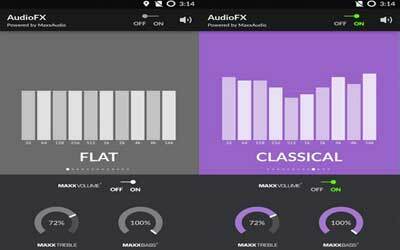 On flat section, you will find treble and bass presets. Tap this bass control to find the suitable sound on speaker. It works similar in treble. All of song can be controlled using flat section. If you want more specific feature, folk and jazz give some interesting presets. You need to know three sections only at standby mode after turning them on respectively. Besides, you can only pick one section then deactivate the rest. To get optimum result, user recommends using excellent quality earphone. Cyanogen audiofx has attractive interface with dark color. Each of section has different color in activation mode. Simple and clean graphic is this app purpose. For avid music fan, this app might too simple and less functionality. However, many people do not put too much concern about audio presets except some basic, such as treble and bass. This is main reason of development Cyanogen audiofx. Put aside many audio presets and replace with three sections. Therefore, Cyanogen audioFX for android is simple but versatile audio to smartphone.